People Hub is the phonebook that you'll find on the Nokia Lumia 830, and is one of the more capable such applications we've seen. It supports multiple accounts, including social ones, and has multiple pages like the rest of the WP interface. The first page is your contacts list, the second one is What's New with all of your friends' social updates, then come (chat) Rooms, and Groups. Just like the People app, viewing a single contact also allows you to check this specific person's social updates plus you can view the complete history of exchange with this contact in one place, displayed chronologically. Everything but status updates is listed here: calls, texts (actually threads from the Messaging hub) and emails. The Me tile is also available, which acts as your collective social hub - you can see all of your social updates here, post statuses across all services, and even a check-in option is available. You can send IMs to your Facebook/Twitter friends from the Me app, too. The phone application on the Nokia Lumia 830 shows you call history with call duration, courtesy of the WP 8.1 update. There are shortcuts to voice mail, dialer and phonebook. Smart dial is not supported, but you can use Cortana to dial someone in a flash. One new feature you'll notice in the in-call screen is the Skype button. If you hit it, your call will be automatically transferred into a free Skype video chat. Of course, the other user must have a Skype client installed plus an active internet connection. 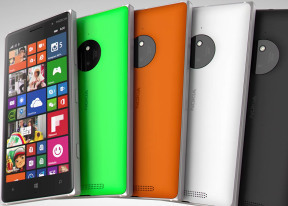 We ran our traditional loudspeaker test and the Lumia 830 scored a Good mark. The loudspeaker isn't the loudest around but missed calls shouldn't be a problem. The Messaging hub has two new options - a shortcut to go to the contact's full details in People Hub, plus a setting to mute the thread. If you choose Mute, then you'll stop receiving any notifications for incoming messages from this number, though the messages will still be saved in the thread. Threads are the building blocks of all non-email messaging. As a sort of conversation view, threads mash together SMS, Facebook and Windows Live messages. That's one thing we love about Windows Phone: the Messaging hub removes the old division between texts, IMs, social messages. The native email client has very simple interface but it offers everything an email client should feature - support for multiple accounts, threaded view, batch operations, search. Linked Inbox is available too - you can link all of your mail boxes into a single one from the Outlook app's settings. While retaining the same looks, the virtual keyboard now supports Wordflow - a Swype-like input method allowing you to quickly input words without lifting your finger by swiping through the letters. It is extremely accurate and recently managed to set a new Guinness Record for typing on a virtual keyboard.